1001 Pages (2008) is from a series of shadowpieces in which Afruz Amighi uses light and shadow to create complex and engaging designs. Amighi employed a stencil burner to hand-cut the design from a thin, porous sheet of plastic – a material used in the construction of refugee tents. 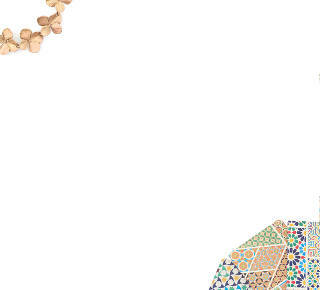 She created a complex pattern based on designs from Iran's Islamic past and present, combined in a new and engaging way. The work is suspended, and an overhead projector illuminates the piece, casting a strong shadow of the intricate pattern against the wall behind. The result is beautiful – the plastic sheet dematerialises as the viewer's eye concentrates on the pattern in the sheet and the shadow it casts on the wall. To create her designs, Amighi is inspired by a range of Islamic sources, including carpet design, miniature painting and architectural decoration. Through intricate sculptures with surfaces that suggest beauty and decadence, Amighi creates a realm in which violence and tranquility collide, exploring the often tumultuous history of Iran. Highlighting her own absence from the people and events that shaped these accounts, she casts a unique perspective of modern Iran, with an ambiguity that concurrently provides an intimate view into the architecture, myths, religion and convoluted pattern work that surrounds present-day Tehran. Amighi was born in Tehran, Iran and lives and works in New York. The panel of judges was chaired by Mark Jones, Former Director of the V&A. 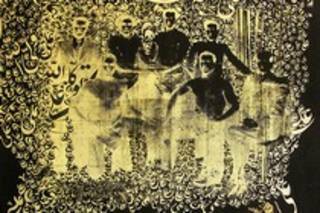 Hamra Abbas was short-listed for the Jameel Prize 2009 for her series, Please Do Not Step. These works were installed on the floor of the display space, and, despite the title, visitors were expected to walk over them, contradicting their expectations of how to behave, and helping to destroy the works themselves. In this way, visitors took on the role of outsiders intervening in the area occupied by the work, just as so many Westerners have intervened in the Islamic world over the last two centuries and more. As a result, Abbas's participation in the Jameel Prize involved creating a new work entitled Loss of a Magnificent Story. 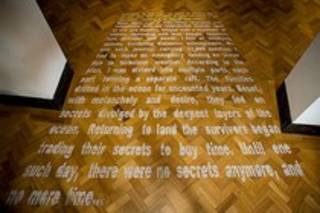 She created a paper collage on the floor of the exhibition gallery, using small slips printed with the words, 'Please do not step'. Up close, the paper collage took the form of Islamic geometrical patterns, but viewed from a distance, it was seen as a passage of narrative text in English. At the micro-level, the work was evidently Islamic in inspiration, but the text, too, referred to the great Islamic tradition of story-telling and told of its loss. The V&A itself contains images illustrating a lost cycle of stories, The Adventures of Hamza, which were whisked away during the period of British rule in South Asia. 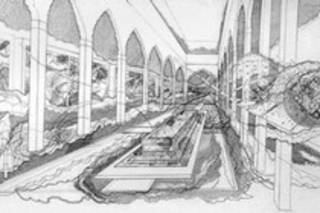 The work was designed to work on many levels, 'narratives within narratives', as Abbas described it. On de-installation in September 2009, the work was destroyed – as was intended by the artist. It was replaced by a smaller, related work, entitled Paper Plates, for the subsequent tour of The Jameel Prize 2009 exhibition. In Paper Plates, Abbas targets the 'skewed dynamics of cultural consumption'. Thin strips of paper have been printed with the phrase, 'Please get served', endlessly repeated. 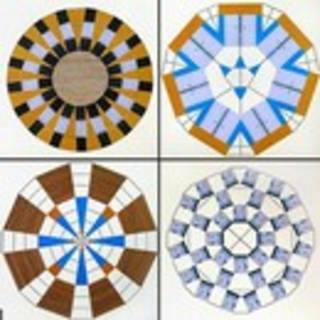 Discs of paper collage were made by combining the strips in complex geometrical patterns, which are recognisably Islamic. The discs were then hot pressed into paper plates, a part of every day life in every continent. The plates, though, are full of holes and cannot be used to 'get served'. This contradiction provides the work with its power and captures the centrality, urgency and vulnerability of the role of Islam in today's world. Hamra Abbas was born in Kuwait and lives between Pakistan and the USA. 'Musulmanes, Musulmans' (Muslim Women, Muslim Men), Reza Abedini, 2004. © Reza Abedini. Reza Abedini has played an important role in the resurgence of Iranian graphic design since the 1990s. 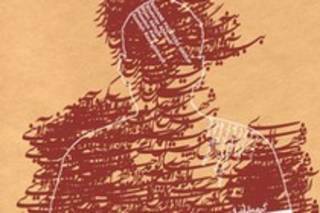 He was shortlisted for the Jameel Prize 2009 for a series of posters in which calligraphy and the human form both play a role. The artist's work reflects the literary and visual traditions of Iran, as well as international developments in graphic design. Calligraphy has a central place in Iranian culture, where the Arabic script is written in different styles in different contexts. Abedini often uses it in combination with images to suggest human beings as the bearers of thought. His other sources include Iranian architecture, with its contrasts of white and ochre brick. Abedini's work illustrates how figure and text can be closely connected and through his use of space and the adornment of text he makes reference to historical tendencies. Abedini shows a selection of four posters, including Musulmanes, Musulmans (2004), Badaneh (2004) and IAF (2007). Reza Abedini was born in Iran lives and works in the Netherlands. 'Umut Kapısı' (Gate of Hope), Sevan Bıçakçı, 2007. © Photos: Reza Hemmetirad and Levent Yucel. Private Collection. Sevan Biçakçi creates hand-crafted jewellery combining contemporary glamour with vivid evocations of historic cityscapes and urban life of his native Istanbul. 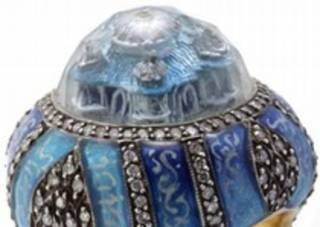 His designs, which can represent an entire Ottoman mosque on the body of a single ring, are realized in a wide range of techniques he has introduced; these include metal-based painting, engraving, calligraphy, intaglio carving and micro-mosaic setting. Biçakçi's jewellery pieces reflect a reverence to jewellery designed from the soul, rather than by technology. Biçakçi is one of several non-Muslim artists and designers shortlisted for the Jameel Prize, and like them all, his birthplace was a predominately Muslim city. He was born in Istanbul, into an Armenian Christian family. At the age of 12 he was apprenticed to a jeweller, entering a trade in which Istanbul Armenians have long excelled. His work is based on tradition but is not held back by it: craftsmen from many traditional disciplines execute his designs. In the rings, Biçakçi uses materials of the highest quality to evoke the Ottoman architecture of Istanbul. Saray Burnu (Seraglio Point, 2005), for example, shows two dominant features of this part of the city: the domed mosque of Ayasofya and the sea walls of the Topkapi Palace. The sea walls are depicted in micromosaic, while the mosque was carved in deep intaglio into an aquamarine, which was then painted. Sevan Biçakçi was born in Istanbul, Turkey and still lives and works there. 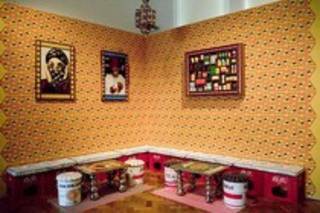 Hassan Hajjaj's work is a zestful commentary on the strength of Islamic traditions in the face of external challenges. He highlights the power of image and branding but also shows how this power can be subverted. The logos of major Western brands appear on traditional Arab items, while local brands convey a nostalgic sense of place. Le Salon (2009) is a multimedia installation, in which "the viewer is drawn into an interactive social space where furniture and everyday objects made from recycled materials reflect the colour and atmosphere of the souk", explains Hajjaj. Exploiting the familiar international power of branding and consumerism, the artist juxtaposes the iconography of contemporary culture with classical references, aiming towards a new aesthetic. Hassan Hajjaj was born in Morocco and lives and works between Morocco and the UK. The Arabic script has been used in Iran for more than a millennium, while photography reached the country before 1850. Khosrow Hassanzadeh combines them in the series Ya Ali Madad, which is based on an old photograph of wrestlers holding hands. Hassanzadeh states: "On either side of them are a court intellectual, a dervish, a general and a mullah. The wrestlers represent many aspects of Iranian culture that we are losing today". In the Ya Ali Madad series, "I want to remind people of their beauty, strength and honour". The series title is a prayer invoking the help of Ali, the first Imam in Shi’ite Muslim tradition. Hassanzadeh’s works are in public collections including the British Museum, London; KIT Tropenmuseum, Amsterdam; The Tehran Museum for Contemporary Art; and the World Bank in Washington D.C.
Khosrow Hassanzadeh was born, lives and works in Iran. Four drawings in two layers, Susan Hefuna, 2006. Courtesy of the Trustees of the British Museum. 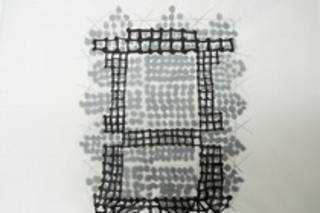 Since 1991 Susan Hefuna has been fascinated by the mashrabiyyah screens (latticed woodwork screens) used to cover windows in Islamic Cairo. They filter light and allow air to circulate, but also allow women to look out without being seen. Hefuna notes that each screen "operates in two directions; it separates but also filters and joins". The designs of mashrabiyyah screens often include words, which seem like patterns or abstract images to those who cannot read them. The words, and the screens themselves, "act differently depending on who is reading them and in which cultural context". In Ana (2006), the word Ana is the Arabic first person pronoun, ‘I’. Susan Hefuna was born in Germany and lives and works between Egypt and Germany. 'Jihad Pop Progression 4 - Interior Courtyard 1', Seher Shah, 2006. Courtesy of the artist and Bose Pacia Gallery, New York. Seher Shah's work is layered with many shifting historical and geographical references. Trained as an architect, she combines large formal elements with intricate drawing on the scale of Islamic miniature painting. In the Interior Courtyard series, courtyards in Granada and New Delhi merge with memories of urban spaces in Zanzibar and Brussels, while the Black Cube series "focuses on the geometry of the Cube form in its multiple permutations", says Shah. A key reference is the Ka'bah in Mecca, the great cube-shaped building that is the focus for Muslim prayer and pilgrimage. Seher Shah was born in Pakistan and lives and works in the USA. 'Dividing Lines' Artist’s book, Camille Zakharia, 2004-6. © Photo: Camille Zakharia. Camille Zakharia was shortlisted on the basis of works from two series. In the first, called Dividing Lines, he produced large collages from photographs of street markings, exploiting the patterns of white, yellow and blue paint on dark asphalt. He then used the discarded scraps to make an artist's book, completed in 2006. This is filled with geometric designs influenced by Islamic carpets and tile mosaic. At the V&A, the artist's book was joined by two works from a second series, called Markings, in which Zakharia used photomontage. The montages were created using single negatives, which were manipulated to draw geometric shapes. All three works reflected the artist's longstanding concern with issues of identity and diaspora, which reflect the 23 years he has spent wandering the globe – he now lives in Bahrain. They are reflections "on how we try to live in harmony within defined spaces set by others", he says. Camille Zakharia was born in Lebanon.